A recent report published by Infinium Global Research on respiratory devices market provides an in-depth analysis of segments and sub-segments in the global as well as regional respiratory devices market. 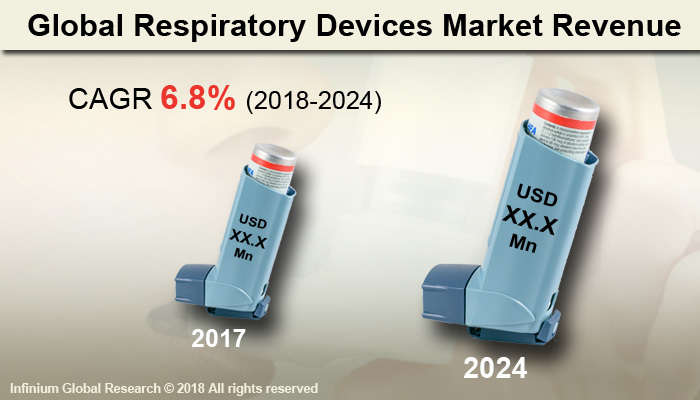 The study also highlights the impact of drivers, restraints, and macro indicators on the global and regional respiratory devices market over the short term as well as long term. The report is a comprehensive presentation of trends, forecast and dollar values of global respiratory devices market. According to the report, the global respiratory devices market is projected to grow at a CAGR of 6.8% over the forecast period of 2018-2024. A respiratory disease affects the lungs and other parts of the respiratory system. This disease may cause by an infection, by smoking tobacco, or by breathing in secondhand tobacco smoke and other forms of air pollution. Respiratory devices are a medical device to assist patients suffering from breathing problems. Respiratory devices automatically adjust the inhalation and exhalation to the patient’s needs. Moreover, respiratory devices deliver medicine to treat numerous respiratory disease. These devices are available in various versions such as long-term respiratory devices, emergency respiratory devices, and mobile home respiratory devices. Respiratory devices are used in asthma, chronic obstructive pulmonary disease (COPD), lung cancer and pulmonary fibrosis. In 2016, According to the world health organization, it is estimated that 3.17 million deaths were caused by the COPD disease and currently 251 million cases of COPD were occurring globally. WHO predicts that COPD will become the third leading cause of death worldwide by 2030. Growing prevalence’s of Chronic Obstructive Pulmonary Disease (COPD) and sleep apnea over the globe is the key factor fuelling the growth of respiratory devices market. Additionally, a rise in demand for nebulizers, humidifiers, and respirator due to increasing prevalence’s of respiratory diseases. Moreover, growing government funding for the healthcare sector and strategic alliances among the leading key players are supporting factors escalating the demand of the market. However, less awareness regarding the usages of respiratory devices and the high cost of this device restraining the growth of respiratory devices market. Going further, rising development in the manufacturing of respiratory devices such as mechanical ventilators, oxygen concentrators are expected to create growth opportunities for the respiratory devices market during the forecast period. On the basis of region, the North America region dominates the respiratory devices market followed by Europe. The factors responsible for the growth of the market such as the presence of key players greatly developed healthcare infrastructure and a growing number of people suffering from respiratory diseases. The Asia Pacific is expected to be the fastest growing region in the respiratory device market during the forecast period. Growing geriatric population, rise in prevalence’s of respiratory diseases and steadily developing healthcare infrastructure are some factors expending the demand of market in the Asia Pacific region. The report on global respiratory devices market covers segments such as product type, application, and end user. On the basis of product type, the global respiratory devices market is categorized into therapeutic devices and diagnostic and monitoring devices. On the basis of application, the global respiratory devices market is categorized into a chronic obstructive pulmonary disease, asthma, pneumonia, and obstructive sleep apnea. On the basis of the end user, the global respiratory devices market is categorized into a hospital, diagnostic center and specialty clinics, and others (physician office). The report provides regional analysis covering geographies such as North America, Europe, Asia-Pacific, and Rest of the World. In this section, the key trends and market size for each geography are provided over the period of 2016-2024. The countries covered in the North America region include the U.S., Canada, and Mexico; while the Asia-Pacific region includes countries such as China, Japan, India, South Korea, Malaysia, and among others. Moreover, Germany, U.K., France, Spain, and Rest of Europe are the major markets included in the European region. The U.S. drives the growth in the North America region, as it is the largest market in the region. In the Asia-pacific region, rapid industrial growth in India and China offer substantial potential for the growth in the respiratory devices market. As a result, the APAC region is projected to experience growth at a CAGR of x.x% over the forecast period 2018-2024. The report provides profiles of the companies in the global respiratory devices market such as Philips Healthcare, ResMed Inc., Medtronic plc, Masimo Corporation, Becton, Dickinson and Company, Chart Industries, Inc., Drägerwerk AG & Co. KGaA, Hamilton Medical AG, and Fisher and Paykel Healthcare Limited. The report provides deep insights into the demand forecasts, market trends, and micro and macro indicators. In addition, this report provides insights into the factors that are driving and restraining the global respiratory devices market. Moreover, The IGR-Growth Matrix analysis given in the report brings an insight into the investment areas that existing or new market players can consider. The report provides insights into the market using analytical tools such as Porter's five forces analysis and DRO analysis of respiratory devices market. Moreover, the study highlights current market trends and provides forecast from 2018-2024. We also have highlighted future trends in the respiratory devices market that will affect the demand during the forecast period. Moreover, the competitive analysis given in each regional market brings an insight into the market share of the leading players. This report will help manufacturers, suppliers, and distributors of the respiratory devices market to understand the present and future trends in this market and formulate their strategies accordingly.